This page introduced the founders of the association. Click on the accordions below to open their respective biographies. He was a WWII US veteran. He landed in Vierville-sur-Mer (Calvados Department) on June 13, 1944, the day he turned 27. He was a Lieutenant in the 30th US Infantry Division and liaison officer which explains why he perfectly knew each and every Norman small roads and villages. St-Jean-de-Daye is the first village he liberated. He took part in Operation COBRA which followed the liberation of Saint-Lô, then in the hard fighting in Mortain. His combat led him to Domfront, Evreux, in the Bulge, then in Belgium, the Netherlands and finally in Germany until the end of the War. He spent several years in the occupied Germany and upgraded to Major. He was president and historian of the US Infantry Division veterans association. He was also the founder and manager of the WWII museum at Camp Blanding, Florida, where several American divisions trained before departing to England. He was married, father of four, grandfather, great-grandfather and lived in Brooker, Florida. He was at the origins of the cration of « Les Fleurs de la Mémoire », the association whose members lay flowers on the soldiers' graves in the American Cemetery in Normandy (Colleville and St James). Here follows some excerpts of the letter Frank sent in December 2000 to Claude Lavielle, president and founder of this association. (1) To this day, more than 10,000 graves are adopted through « Les Fleurs de la Mémoire ». 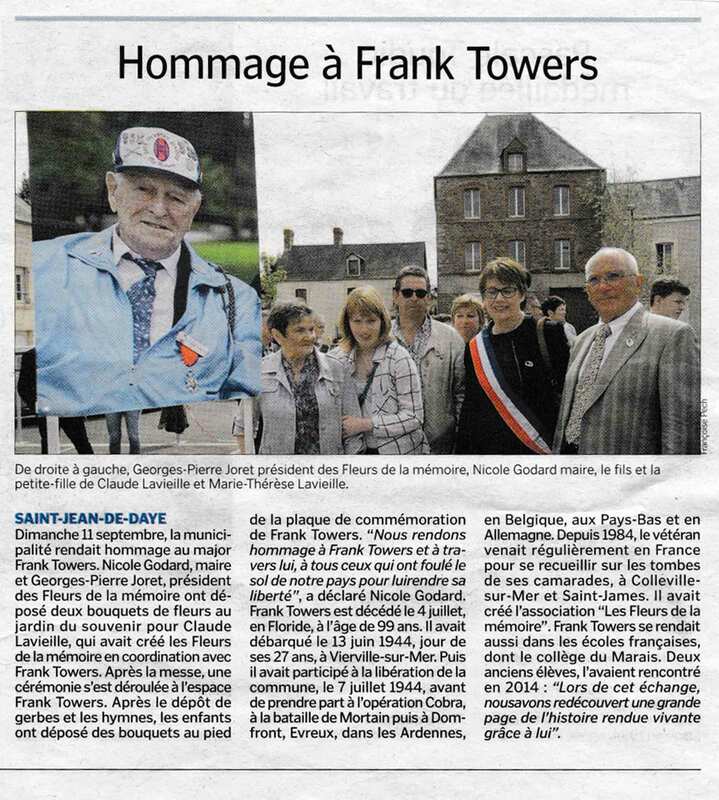 Frank Towers was a tireless ambassador of Peace, Remembrance and French-American friendship. Since the 80's, he came to Normandy about every two years and stays in a French family who considers him a member of the family. He fought for France. He loved and respected this country which he tried to be better known by his compatriots, and particularly the young ones. He kept in touch – through mail, internet, invitation at his place or visiting – with the countries he liberated's inhabitants, officials or citizens. The main goal of his visits to France was to visit his brothers in arms' graves in the two American Cemeteries : Colleville and St James. But then, he was alwways willing to meet with people and learn more about the friendly people of Normandy. He went many a time in schools and junior highs so as to meet young people. We must, of course, remember those who made the ultimate sacrifice to defend Liberty but we must also acknowledge that war is terror and do every thing we can to preserve Peace. Once back home, he did the same with the youth of his country who ignore all or almost all of what happened during World War Two. He organized regular meetings and hosted conferences. He voluntarily took part in the creation and operation of a WWII museum in Florida. He organized four veteran trips to France (275 persons in 1984) and every time it was some meetings and exchanges with the population. These bounds always remained. During the second war in Iraq, Frank took a stand in the French position and stated loud and clear, by interposed media, that, no, France had not forgotten the USA action back in 1944. He told on the radio and american newspapers about the warm welcoming of veterans in Normandy and affirmed relentlessly the friendship uniting the people of our two countries. « Soon, I will be too old to travel to France. Then, who will visit my comrades buried in Normandy ? He was then behind the creation of « Les Fleurs de la Mémoire » whose he was sponsor, honorary member and supporting member. He was also made honorary citizen of several French towns. During his trip to France in 2009, he was awarded the French Légion d'Honneur. He came back in Normandy in April 2010 to celebrate the 10th anniversary of « Les Fleurs de la Mémoire » on the occasion of the Congress in Cabourg. His last trip in Normandy dates back from June 2014 to commemorate the 70th Anniversary of D-Day. 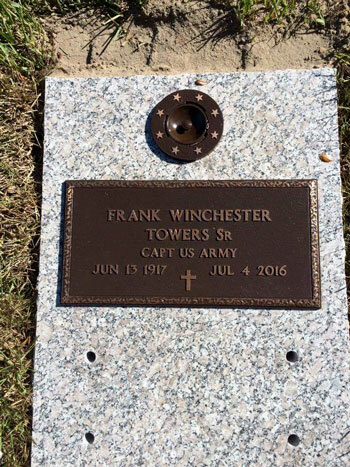 Frank passed away on July 4, 2016 in Florida. Yet retired, he remained active, he decided he would dedicate his live to the leitmotif LEST WE FORGET and committed to sharing the Memory of the 30th Infantry Division being unwilling the ones who gave their all to be forgotten. The association determines one first challenge : 500 graves adopted in 2001. More than 2,000 will be adopted ! Early November, Christophe Lavieille, Claude's son, went to Florida and on behalf of the association laid flowers on Frank's grave and placed an ex voto. 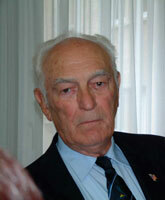 Claude Lavieille was born in 1932 in Coutances. His parents ran a café facing the stadium. During the war, he endured the bombings while he was 12. He remained traumatized for a long time, to the point of having a fear every time he heared airplanes. He took a training course so as to become a fitter then left for Germany for a 18 months period of time for military service. He became a staff-sergeant. In 1952, since he coud not find a job related to his training course, he joined the Manche Rurale – the Rural Manche, a local newspaper – in Coutances. In 1954, he met Marie-Thérèse Champel (also known as Marie-T) whom he married in 1955. They settled in La Chapelle Enjuger – village which was completely destroyed during Operation Cobra). He was drafted to go to Algeria in 56 where he stayed for 5 months. A particularly long period of time since his wife gave birth to Philippe, their first son, while Claude was in a fighting zone. In 61, Claude and Marie-T have another son, Christophe. After he attended a training course in Paris, Claude officially became a reporter. He joined the Manche Rurale in Saint-Lô. In the mid 60's, the family settled in Sant-Jean-De-Daye (where Marie-T is an English teacher). In 68, Claude became co-founder of « L'Agriculteur Normand » - The Norman Farmer – (agricultural newspaper in Caen). Committed to social and cultural life, Claude was elected as a town councillor from 71 to 83. He was deputy mayor twice from 83 to 95. He also was president (freely) of the town's emergency services. In 74, he created the day care center in St-Jean-de-Daye whose he will be president for 18 years. Today, it's named after him. At the village's main crossroads, it faces the square Frank Towers. He became general subeditor of the press association « Réussir » - Succeed – in 78. He founded and hosted the Training Center of the Agricultural Press whose he was the vice-president. In 1984, Claude met Frank Towers for the first time. The town council organized a reception to welcome the veterans and their families who visited the area upon the 40th anniversary of D-Day. The two men and their families made friends with each other. When he retired in 1991, true to his altruistic ideas, he remarkably developped the Manche Food Bank. He achieved feats at the service of the most impoverished persons presidding over it for 3 years. This period constitutes the height of his social and humanitarian commitment. Simultaneously, he visited patients at the France United-States Memorial Hospital in Saint-Lô. His devotion and benevolence made the patients think he was a priest! It is true that Claude had Faith (which he practiced without any proselytism). In 2000, upon Frank Towers' request, Claude created the association « Les Fleurs de la Mémoire » with his wife. Its goal is to adopt and lay flowers on the graves of the soldiers resting in the American Cemeteries in Colleville and St James. He presided over it until he passed away in 2005. Ten years after its creation, the association had more than 3 600 members who adopted and, at least once a year, lay flowers on more than 10 000 American soldiers graves whose families have never – or very rarely – been able to visit because of distance. He passed away in October, 2005, shortly after having celebrated his golden wedding anniversary with Marie-T. Indeed, we cannot mention Claude with his faithful and valiant muse. Discreet, efficient, she has always been there to assist him. She remains much involved in the association. Her patience and expertise are a model for her relatives. Here is for Claude's deeds, man of integrity, oblivion and injustice fighter.